Juices are an effective way to improve our immune system and digestion. For a healthy diet, it is very important that you incorporate a sufficient amount of vegetables and fruits in your daily routine. Consuming them raw is better since it allows you to benefit from the natural goodness that they all are packed with. The best way to eat your fruits and vegetables is to juice and drink them up. You can consume more amounts of vegetables and fruits this way. For example, eating 5 carrots would not be easy but if you want to benefit from them, you can always juice them up and drink the glass of juice you have prepared. In case you don’t like the taste of the food, you can mix in other flavors to enhance the taste. For example, spinach juice on its own might not taste that good but when mixed with apples and lemons, it makes a pretty interesting drink which is perfect for breakfasts. It is particularly beneficial for people who suffer from the mucoid plaque which prevents the absorption of the nutrients from the food eaten. 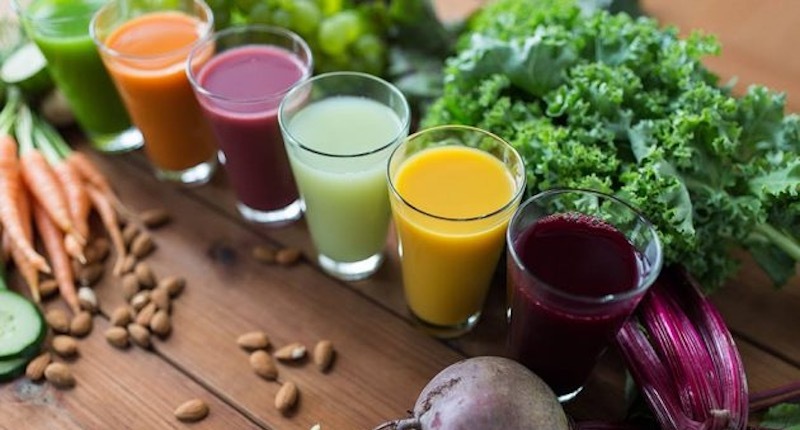 Consuming juices can help their body absorb the maximum of the nutrients it can from the vegetables and fruits that are used in making the juice. You can add in other beneficial supplements to the vegetable juices you consume e.g. flaxseed oil for omega3 fatty acids, cod liver oil for vitamin A and D etc. It is believed that vegetable juices are healthier than fruit juices since they do not affect the insulin levels in our blood. However, vegetable oil doesn’t have proteins or fats so it is important that you add in other essential oils to them which can fulfill your body’s fats and proteins requirements. Some of the vegetables that you can use in your juices are kale, lettuce, spinach, cilantro etc. Juices make it easier for us to consume the leafy vegetables in their fresh form. In order to make a juice which is healthy in all the many ways, there is a lot you can do. Begin with a freshly washed blender so that whatever you make is hygienic and clean. Once you are done using it, wash it instantly to prevent the growth of mold and other bacteria. Prepare fresh juice every day. Storing or freezing away the juice would make it lose its benefits and nutrients which would defeat the whole purpose of consuming the fresh vegetables. Once the juice is prepared, do not throw away the pulp since it is rich in fiber. Mix it back in the juice while you drink it. It will help with bowel movement and prevent the growth of certain bacteria in the colon. Juices are an effective way to improve our immune system and digestion. They make the consumption of fruits and vegetables easier especially for people who do not like to eat them. Why is Slow Juicing Better?